Last night, this year's first autumn storm hit the Dutch coast. At the Sand Motor, the wave height was approximately 3.5m and the max water level measured was 2.8m, this is 1.5m higher than the normal high tide. You can imagine then, how happy we were this morning to see that our instruments were still there! It seems most of them have been measuring throughout the storm, we can't wait to look at the data! Tomorrow, when the water level drops, we also hope to find all instruments that were deployed in deeper water. As the beach changes continuously we measure everyday with a RTK-GPS system. But, what actually happens with the beach when it is covered with water and waves? 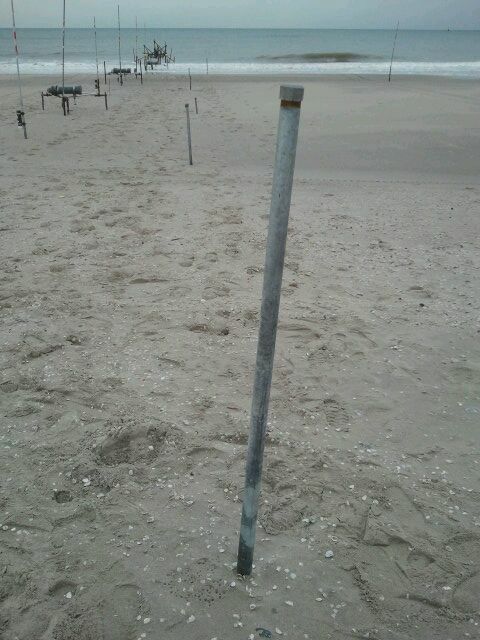 To understand better how the beach changes during high tide, we measure the bedlevel change every 15 minutes. We do this for 4 high tides, each one characterized by other wave conditions. Here we will show the beach profile changes during the high tide of a very calm day, with wave heights < 0.5 m.
In the initial profile (in black) an intertidal sand bar is visible. During this particularly calm high tide, when the sand bar is covered only for a few centimeters with water, the sand bar grows a little in height (~ 5 cm) and moves a little shoreward (~ 2 m) (see final profile in red). The bar grows mainly in height during the first hour (8:00-9:00) of the upcoming tide. The snapshot video below gives some insight in how gently the bar is moving towards the shore. On the beach you can find several types of ripples, such as wave ripples, current ripples and mega ripples. Already before waves break at the shore, their orbital motion reaches the bottom. The velocity under the wave crest is in the landward direction, in contrast to the velocity under the wave trough, which is directed seaward. Near the bed, where the vertical orbital motions are dampened, solely these oscillating horizontal motions remain and induce the formation of ripples. A current with one constant direction can result in the formation of current ripples, which can be recognized by their asymmetric shapes. The shape of these ripples is different from wave ripples. Wave ripples are symmetric with elongated crests parallel to the shore. Stronger currents, like rip currents (in Dutch the so called "muistroom") or strong alongshore currents, can result in the formation of mega ripples. During the field campaign at the Sand Motor, we encountered all types of ripples, but they are not always present at the beach. You might wonder why ripples would be relevant. All these morphological structures are affecting the flow structures and velocities and thereby sediment transport. For my MSc research I'm investigating the effect of these ripples on the magnitude and direction of sediment transport. During the past few weeks there has been a lot of morphological change. The pronounced sandbar, present at the beginning of the fieldwork, is gone. Also the trough became smaller and smaller. 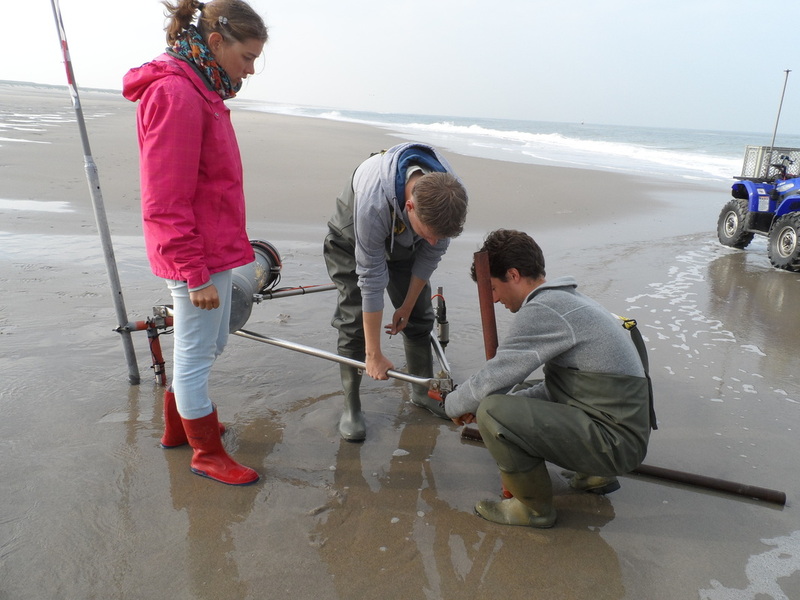 We observed that with small waves the sandbar gained height and moved inland, sometimes with 6 meters a day! During a storm the sandbar flattened, like a pancake. The past few days the waves were small. Under these conditions we expect a new sandbar to develop. This takes time, as a storm caused sand transport to a further offshore location. To be continued! A subject that has not previously been addressed by this blog is the study on the interaction of tides, groundwater levels and surface moisture. As the tide rises, so does the groundwater level below the beach. Through capillary processes, this might affect the surface moisture content. The surface moisture content is important, because it creates or prevents the possibility of sediment transport by the wind. When the surface is wet, the moisture 'glues' the sediment together, and transport by wind is not possible anymore. The groundwater level below the beach is measured by so-called dipwells. They consist of a steel tube with a filter on the bottom, so only water can enter. The height of the water in the tube is the groundwater level. To record the groundwater level, a pressure sensor is inserted in the tube. This sensor measures the pressure above it, which is equal to the air pressure + the water pressure. When air pressure is subtracted, only water pressure remains. Since water pressure is linearly related to water height, the conversion to actual water level can easily be made. Some of the students and scientists are followed by Dutch television. They are keeping a blog on dekennisvannu.tumblr.com. Why does the Sand Motor slowly disappear? The Sand Motor mega-nourishment is designed to slowly disappear. The predicted lifetime is ~20 years. 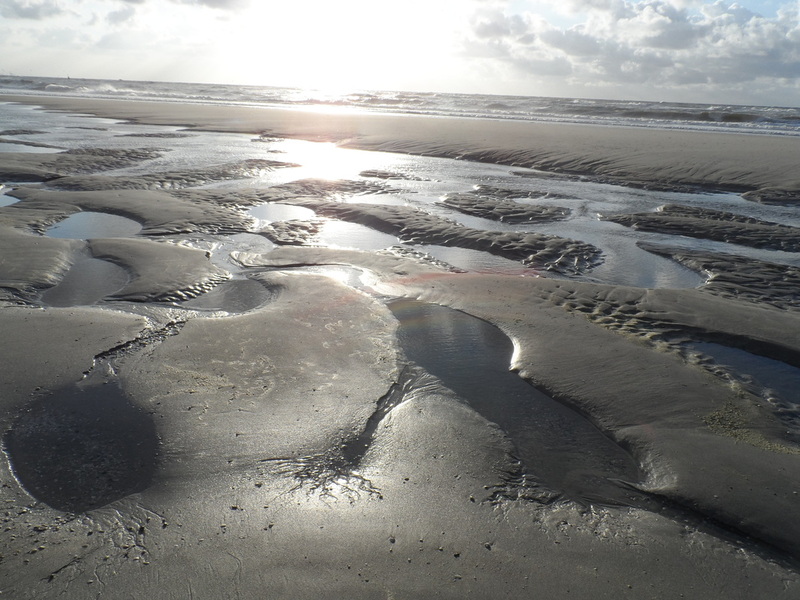 Since the construction of the Sand Motor in 2011, sands have been eroding from the middle part and accreting at the adjacent beaches of Kijkduin and Monster. As a result the hook-shaped peninsula flattened to a nearly symmetric wave-shaped sand body, which is expected to continue the upcoming years. The flattening of such a shoreline perturbation or sandwave is known as diffusion. The diffusivity of the Sand Motor, a long-term process, can be explained by net sediment transport imposed by the wave climate and the shoreline orientation. Aerial pictures from the northern side of the Sand Motor showing the diffusion of the shoreline perturbation; after construction in July 2011 (left) and after three years in September 2014 (right) (Courtesy Rijkswaterstaat/Joop van Houdt). When waves enter the coast under an angle, they generate a longshore current. 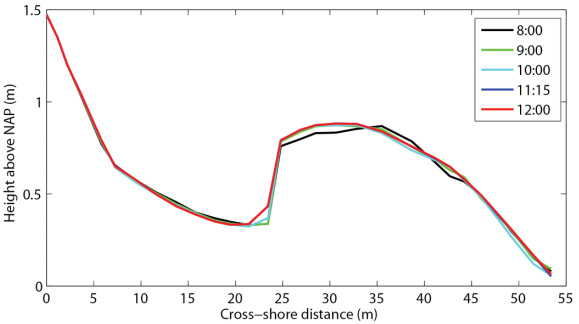 At the Sand Motor the longshore current is varying alongshore in rate and direction, because the angle of wave incidence at the shore is alongshore different (see figure below). This is the result of the curved coastline. The longshore current transports sediments, inducing changes of the morphology. 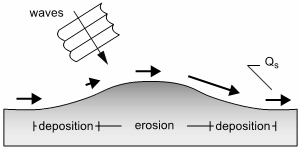 When the wave direction changes, the direction of sediment transport changes and thus the morphology. To explain the long-term (i.e. several years) change of morphology, we need to know the dominant wave direction-which is southwest at the Holland coast. Thus waves enter nearly normal to the shoreline at the southern side, but obliquely at the tip of the Sand Motor. This results in a weak current at the southern side, while the current intensifies at the tip. These gradients in net longshore current induce gradients in net sediment transport, leading to erosion at the tip of the Sand Motor and accretion at the adjacent beaches. Diffusion of an alongshore sandwave, from Ashton and Murray (2006)*. Upcoming week we will report on morphologic change on shorter timescales, such as the migration of sandbars. In total there are four rigs, of which three are mini rigs. In the picture below you can see one of the mini rigs. The rig contains several devices to measure flow velocity, suspended sediment concentration and pressure. On top of the rig a large battery and data logger are attached. The devices only measure when they are submerged, this is controlled by a float switch. The mini rig. The large grey cilinder is the battery/data storage. With the measurements of the frame, MSc student Florian investigates infragravity waves. The normal waves you see propagating towards the beach, are called gravity waves. But there are also longer waves which you can occasionally see when a swash reaches further landward, approximately every 30-300 seconds. There is still some debate about the behavior of infragravity waves in shallow water and how they play a role in sediment transport. These waves are believed to be important for beach erosion during storms. The morphodynamics of intertidal beaches are still not entirely understood. It appears that the equations used to predict sand transport in deeper water are not sufficient to explain morphological change in shallow waters (~<3 meter depth). Yet it is important to understand these dynamics for the design and management of future projects regarding coastal safety. With the data we collect at the Sand Motor we try to gain more insight on these processes. This post will give an overview of all the topics which are addressed during the Sand Motor field campaign, in later posts each research topic will be explained separately. 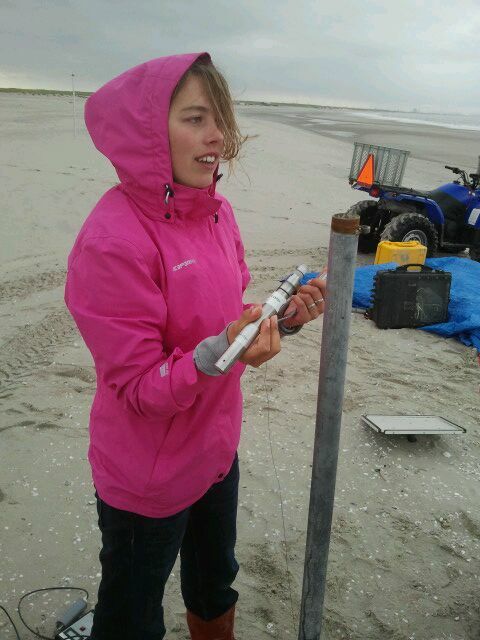 The past weeks we already introduced some of our instruments which were deployed at the beach. To give you a full overview, there is one cross-shore array with 4 rigs, several pressure transducers and groundwater pipes and there is an array with 10 pressure transducers along the shoreline of the Sand Motor. All of our instruments are in the intertidal zone, so during low tide we are able to change their height above the bed if necessary and during high tide the instruments are submerged and measuring. With the cross-shore array we try to understand all processes which are important for sand transport in the intertidal zone. When waves enter shallower water, waves become steep and asymmetric until they break. One of the four rigs is especially designed to study turbulence and sand transport beneath breaking waves. The turbulence generated by breaking waves can enhance the amount of sand which is suspended in the water and can determine the direction of sand transport. This rig also contains a 3D sonar to scan the bed for small bed forms to include the influence of ripples on sediment transport. The remaining three rigs are used to study the cross-shore variability of sand transport, they measure pressure, i.e. water height and thus waves, flow velocities and sand concentrations in the water. 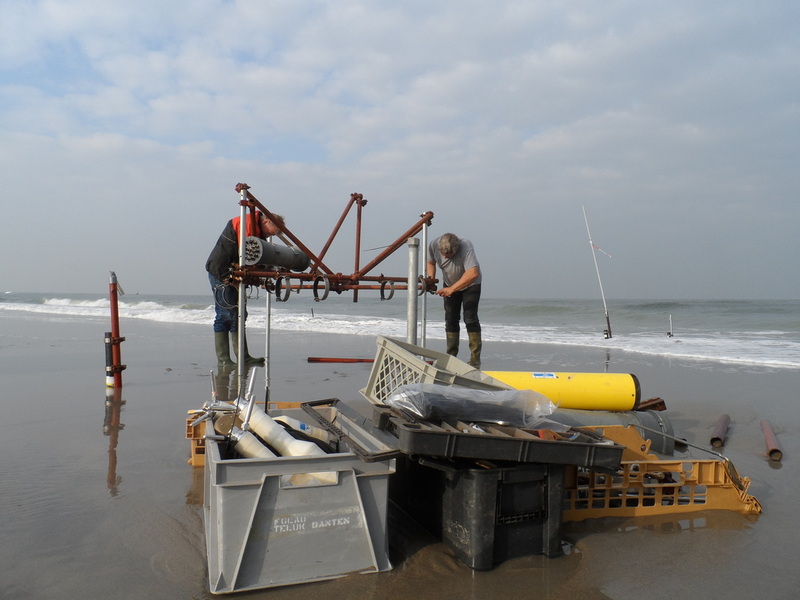 These measurements are mainly used to study the importance of 20-200s long waves for sand transport. Around the cross-shore array, the beach morphology is monitored with RTK-GPS daily, to be able to relate sand transport to beach morphology. The intertidal zone is also an important source for sand which can be transported by the wind. Wind blown sand is important for beach and dune recovery after storms. For this reason, groundwater pipes are added to the cross-shore array to investigate how fast the groundwater drops after a high tide. The beach humidity determines whether sand is available to be transported by the wind towards the dunes. 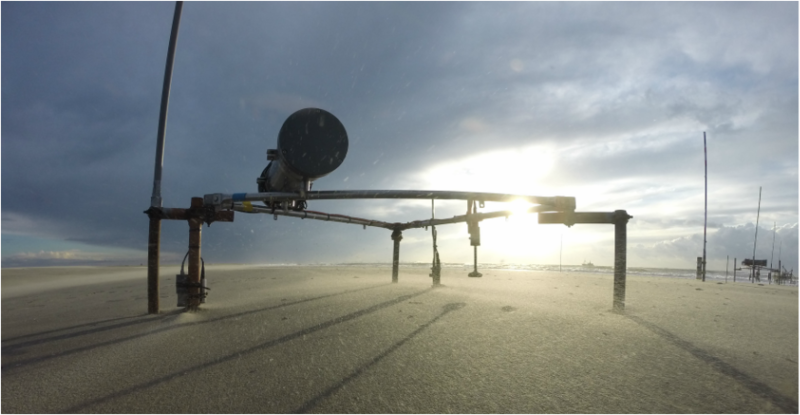 During a storm we will even extend our array with instruments on the dry beach and count sand grains transported by the wind. 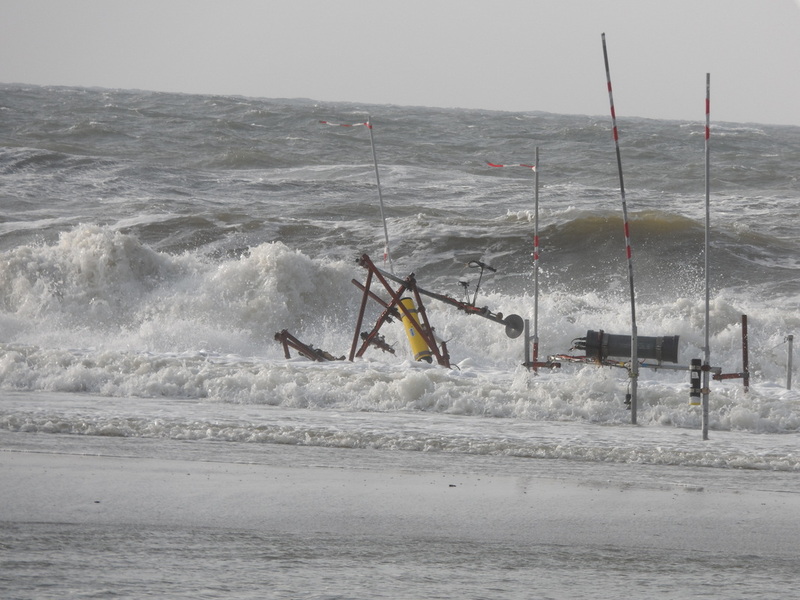 Last but not least, 10 pressure transducers are deployed along the shore of the Sand Motor. These measurements will show the wave energy distribution around the Sand Motor, with which we test our hypotheses of why the Sand Motor is evolving as it is. The Turbulence Rig is deployed again! Today we rebuilt the Turbulence Rig, which got undermined a couple of days ago. The waves and tides were lower than yesterday. With less wind the set-up was almost zero. Besides the rig there was a lot more work. Due to the large waves the beach profile has changed. 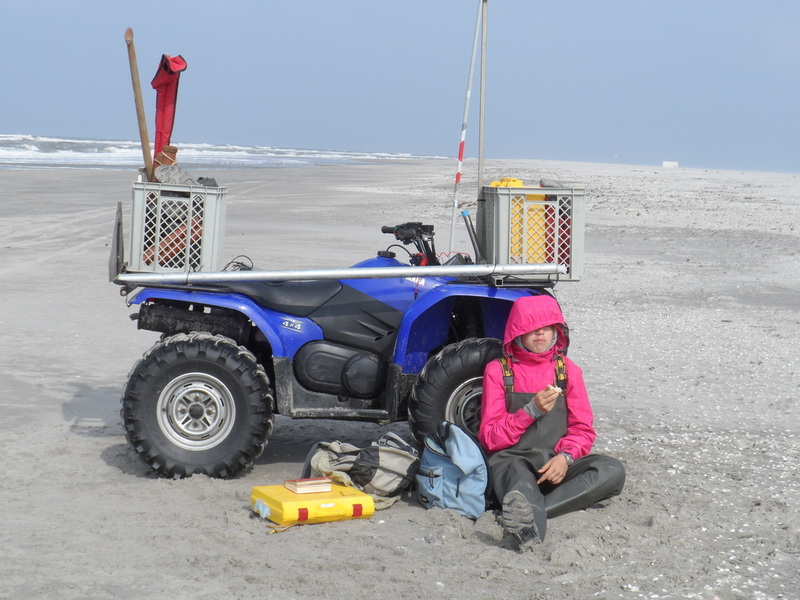 The smaller frames and other measurement equipment were either too high or too low above the beach surface. Below one of the three Mini-Frames, work in progress. When all the instruments were deployed and placed on their correct heights it was time for the groundwater and soil moisture measurements. We measured from low water to high water. In between the measurements the quad bike provided some shelter from the wind. The weather forecast for tomorrow is bad: rain, wind and possibly some thunder. Hopefully we'll be able to measure the exact location and height of the Turbulence Rig. The northwestern winds have generated large waves, that hit the Sand Motor with a lot of power during the storm. The Turbulence Rig is the most seaward located frame that was installed, so it catches the largest breaking waves. The frame is equipped with a velocity meter, suspended sediment sensor and a sonar for the bottom profile. 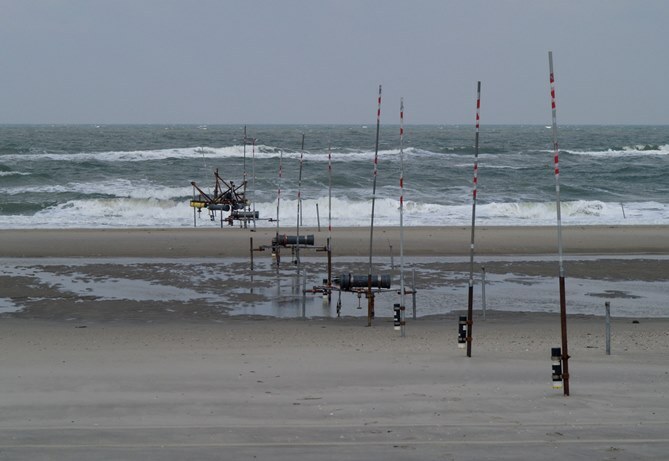 The rig was anchored in the sand with three large poles, but due to the storm a lot of sand washed away and one of the poles got undermined by the waves. The rig toppled and the other poles bended. The rig lay flat on the seafloor. 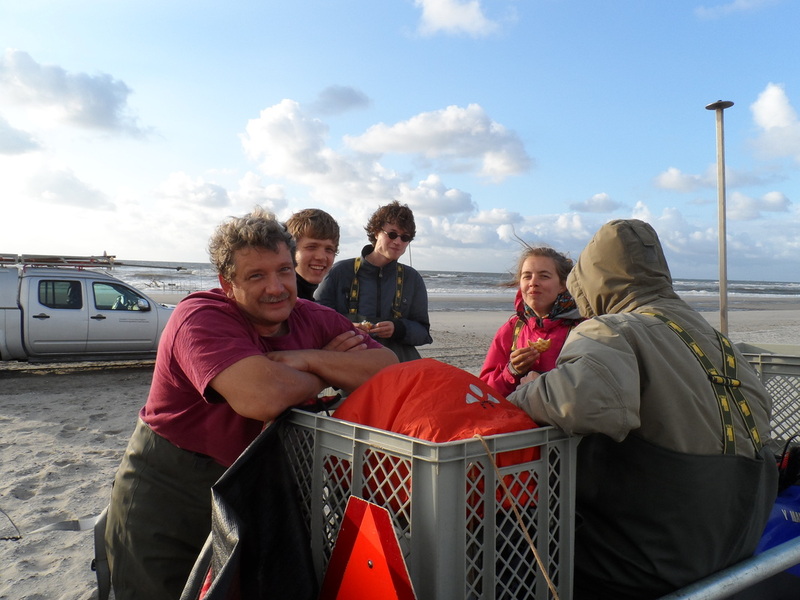 In the evening our technician Henk helped us to save all the equipment. Below a picture of the Turbulence Rig Rescue Team, and the frame which is saved. Due to the storm the beach profile has changed. During the calm and sunny weather earlier this week, the profile was relatively steep with a high intertidal bar. At the time of the storm strong currents are found between the intertidal bar and the swash zone. In the channel dunes have developed. Today almost all dunes are gone and the beach has flattened.